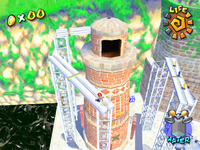 The Secret of Ricco Tower is the fourth episode of Ricco Harbor in Super Mario Sunshine. 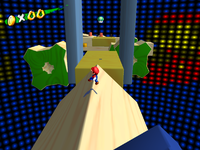 The episode's objective is to enter Ricco Tower and clear the secret course. In Super Mario Galaxy 2, the secret course appears as its own galaxy named the Twisty Trials Galaxy. Mario making his way to the tower. In order to enter Ricco Tower, the player needs to collect the Rocket Nozzle on a roof in the plaza. The player can take the Manhole at the start of the level and use it to reach the rooftops. Once the Rocket Nozzle has been collected, the player needs to make their way to the lower port with the large tower in it. Using the Rocket Nozzle, the player can launch to the high platforms and use them to reach the entrance into Ricco Tower. Upon entering the tower, Shadow Mario will appear to take F.L.U.D.D. away. The player will start the secret course facing four long, rotating platforms. To cross them, the player needs to stay on the most level surface of the platform while jumping from one platform to the next. After the four rotating platforms is a stationary platform with two tall walls on either side, the player can reach a 1-Up Mushroom above by Wall Jumping. Afterward are three horizontally moving and rotating gear-shaped platforms the player has to jump between to cross to the next segment. The next set of platforms are several long, rotating platforms like those at the start of the stage. However, these ones are angled and turn in different direction, and the second to last platform is much larger than the rest. After the final platform is the stage's Shine Sprite. This page was last edited on November 7, 2017, at 16:29.